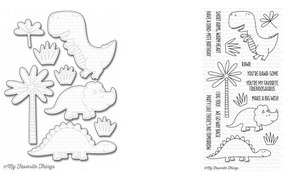 We’re taking it back to the Mesozoic Era with the You’re Rawr-some stamp set! Channel your inner paleontologist with these adorable dinosaurs (a T-Rex, Triceratops, and a Stegosaurus, in case you were wondering!) and create delightful scenes for the dino lovers in your life. Add dino-mite details to your scenes with the palm tree, grass, and leaves provided. The clever and punny sentiments are perfect for birthday, friendship, encouragement, love, and all occasion cards, and our Stitched Mountain Range Die-namics would be a perfect fit with this set. The super cuteness of the You’re Rawr-some set will never go extinct! There’s no bones about it ¬— you’ll love it. Period. This 17 piece set coordinates with the You’re Rawr-some Die-namics and includes: Tyrannosaurus rex 2” x 2 7/8”, Triceratops 2 11/16” x 1 5/16”, Stegosaurus 3 1/4” x 1 3/8”, Palm tree 1 3/4” x 2 7/8”, Grass (3) 7/8” x 3/4”, 3/4” x 5/8”, 1/2” x 5/8”, Branch 1” x 1”, and Sentiments (9) 7/16” x 1/4” (Rawr) to 2 3/4” x 1/4” (Party Like…). This Die-namics coordinates with the You’re Rawr-some stamp set for perfectly sized die cuts every time. It is open inside to allow you to stamp then cut OR cut then stamp. This feature makes the Die-namics lighter weight and allows for easier removal from the die. The 8 piece You’re Rawr-some Die-namics includes: Tyrannosaurus rex 2 1/8” x 3”, Triceratops 2 13/16” x 1 7/16”, Stegosaurus 3 3/8” x 1 1/2”, Palm tree 1 7/8” x 3”, Grass (3) 1” x 7/8”, 7/8” x 3/4”, 7/8” x 3/4”, Branch 1 1/8” x 1 1/8”.